The core module pass which does a post-order walk of the SCCs and runs a CGSCC pass over each one. 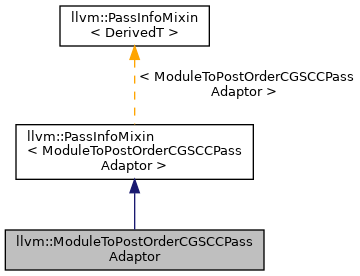 Designed to allow composition of a CGSCCPass(Manager) and a ModulePassManager. Note that this pass must be run with a module analysis manager as it uses the LazyCallGraph analysis. It will also run the CGSCCAnalysisManagerModuleProxy analysis prior to running the CGSCC pass over the module to enable a FunctionAnalysisManager to be used within this run safely. Definition at line 329 of file CGSCCPassManager.h. Definition at line 332 of file CGSCCPassManager.h. Definition at line 337 of file CGSCCPassManager.h. Definition at line 341 of file CGSCCPassManager.h. Definition at line 350 of file CGSCCPassManager.h. References Pass, llvm::RequireAnalysisPass< AnalysisT, IRUnitT, AnalysisManagerT, ExtraArgTs >::run(), and std::swap(). Definition at line 726 of file CGSCCPassManager.h. References llvm::PreservedAnalyses::all(), assert(), llvm::LazyCallGraph::SCC::begin(), llvm::LazyCallGraph::buildRefSCCs(), C, llvm::SmallPtrSetImpl< PtrType >::count(), llvm::CGSCCUpdateResult::CrossSCCPA, llvm::dbgs(), llvm::PriorityWorklist< T, SmallVector< T, N >, SmallDenseMap< T, ptrdiff_t > >::empty(), llvm::LazyCallGraph::SCC::end(), llvm::InnerAnalysisManagerProxy< AnalysisManagerT, IRUnitT, ExtraArgTs >::Result::getManager(), llvm::LazyCallGraph::SCC::getOuterRefSCC(), llvm::AnalysisManager< IRUnitT, ExtraArgTs >::getResult(), llvm::PriorityWorklist< T, SmallVector< T, N >, SmallDenseMap< T, ptrdiff_t > >::insert(), llvm::PreservedAnalyses::intersect(), llvm::AnalysisManager< IRUnitT, ExtraArgTs >::invalidate(), llvm::CGSCCUpdateResult::InvalidatedSCCs, LLVM_DEBUG, Pass, llvm::PriorityWorklist< T, SmallVector< T, N >, SmallDenseMap< T, ptrdiff_t > >::pop_back_val(), llvm::LazyCallGraph::postorder_ref_scc_begin(), llvm::LazyCallGraph::postorder_ref_scc_end(), llvm::reverse(), llvm::PassInstrumentation::runAfterPass(), llvm::PassInstrumentation::runAfterPassInvalidated(), llvm::PassInstrumentation::runBeforePass(), llvm::CGSCCUpdateResult::UpdatedC, and llvm::CGSCCUpdateResult::UpdatedRC. Definition at line 344 of file CGSCCPassManager.h.